Last night, The Legend of Korra returned to television for Book Two: Spirits, and the premiere featured dark spirits aplenty. But far more promising is this season's focus on the nature of family, and the possibility of religious war. Spoilers ahead. If you haven't watched the two-part premiere yet, you can watch it online at Nickelodeon. Even though the first few minutes of the premiere served largely to catch us up with Korra, Mako, Bolin, and Asami, it made me realize how much I'm going to miss spending time in Republic City. Yes, Book One was frightfully uneven, but the worldbuilding was top-notch. Hopefully, with Asami trying to revive the flagging Future Industries, we'll still get some peeks into life in Republic City. Instead, we're headed to the South Pole, where in the post-war era, the Southern Water Tribe has become a secular version of its former self, where the most spiritual of holidays has been reinvented as a joyous winter carnival. It was supposed to be a quick stop on the way to Korra's tour of the Air Temples with Tenzin and his family, and a chance to visit with her own father, Tonraq. But Tenzin and Tonraq's plans for Korra's education come into question when Tonraq's brother Unalaq, the chief of the Water Tribes, appears on the scene. Unalaq has a keen interest in the spirit world, and he believes that the Southern Water Tribe has lost its spiritual way. And the world does seem to be in genuine spiritual disarray; in Southern waters, dark spirits have been attacking ships. He wants to become Korra's new teacher so that she can bring balance to the material and spirit worlds. Korra is feeling a sense of entitlement as the Avatar after her defeat of Amon, but that's just one of many steps she's going to have to take on the road to adulthood. Where Aang's treatment of the Avatar state was tentative, and loaded with the weight of all the Avatars who came before, Korra is too free with the Avatar state, using it in games with Tenzin's children. And while she wants the respect she feels that she is due from her elders, she's still genuinely uncertain about her ability to make decisions for herself. Instead of consulting the adults in her life, however, she confides in Mako, who has no special insight into the challenges of being the Avatar. Unalaq isn't offering Korra tours of the Air Temples and lessons on the history of Avatars; he wants her to dig her hands in right away. For Korra, who is so physical and impatient, this sounds both more interesting than Tenzin's lessons and an appropriate way to grow into her destiny as the Avatar. 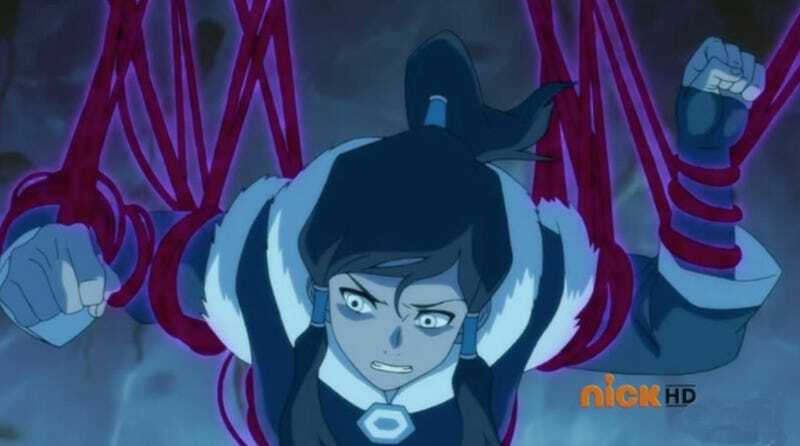 It's worth noting that while Korra still has a lot of her petulance from Book One, she has grown up a tiny bit; she at least questions whether forsaking Tenzin and her father's wishes to apprentice herself to Unalaq is the right decision, and when she succeeds in bringing the Southern Lights back to the South Pole, it momentarily feels like the correct choice. But just because Unalaq is right about many aspects of the spirit world, that doesn't mean that he's correct in all things. In the final moments of the episode, we learn that Unalaq has brought his Northern troops to the Southern Water Tribe, intending to bring spirituality back to the South—even if it's by force. Just when Korra thinks she's found a new mentor, her uncle proves himself bent on occupying her home. While there were prominent adult characters in Avatar: The Last Airbender, it was a show in which the world clearly belonged to the children. The Legend of Korra is much more of a coming-of-age tale, and it makes sense that as Korra bends toward adulthood, that we see the strengths and flaws of the adults in her life. On the one hand, we have serious and studios Tenzin, who is mocked by his more freewheeling siblings. But when Kya and Bumi agree to accompany Tenzin to the Air Temples, they're suddenly immersed in a world in which the weight of their brother's Airbender legacy is finally clear. On the other hand, there is Tonraq, who has hid much from Korra in a misguided bid to keep her safe. Korra may have been rash in her decision to continue her education with Unalaq, but she has not been fully prepared for this decision by her father figures, who have lives and concerns of their own. The two-part season premiere is promising, setting up a clear path for Korra's dealings with the spirit world as well as for her interior journey. And even though we've had a change of venue, the writers still clearly remember that this is a post-war world we're traveling through. Plus, the spirits are always visually fun to watch. I have some concerns about how they're going to handle the show's growing cast of characters, but on the whole, I'm very excited for the season ahead. I adore Aubrey Plaza, but her mechanical April Ludgate act as Korra's cousin Eska isn't doing for me. I'm willing to give her a few more episodes to settle in, though. Will Mako get a proper arc this season? He seemed to be settling in as a police officer in Republic City. Is he going to abandon his career to work alongside Korra? I honestly don't care what Asami is doing; I love her every time she is on screen. Varrick reminded me of that guy from the Futurama episode "Futurestock" every time he called Bolin "Tigershark."